[Time] It doesn't matter, you're at Camp 8 . . .
Camp 8 has one sole purpose: to relay radio calls between the Juneau Base and Camp 18. While the entire expedition is based out of Camp 18, groups of four take turns being stationed at Camp 8 for two nights. It isn’t a terribly long ski (usually four hours) between Camp 18 and Camp 8, but it took us a bit longer due to route conditions on the ridge approaching Camp 8. The snow bridges covering the giant bergschrunds [crevasses that extend all the way through the glacier to the bedrock] and crevasses had collapsed, which made taking the original route dangerous. 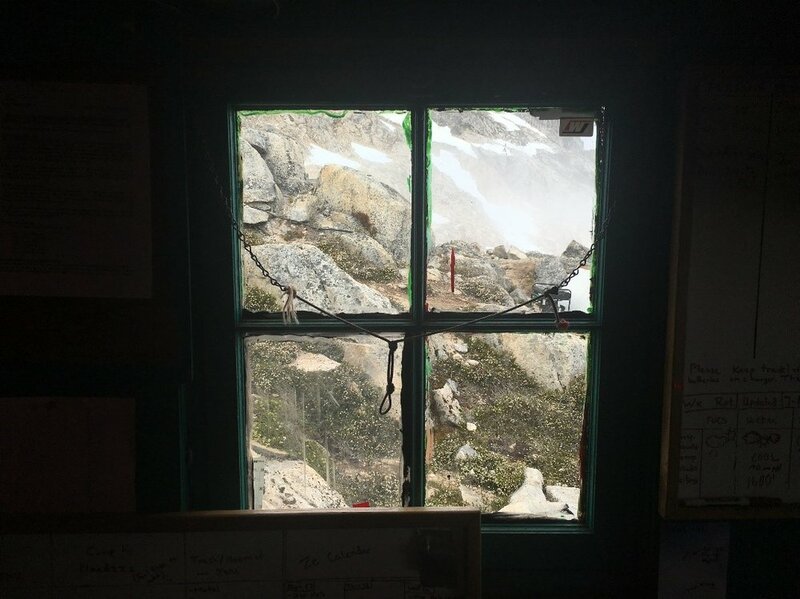 We scouted a new route with help from Gavin, who was manning the radio at Camp 8 and could see the hazards from above. The other three inhabitants of Camp 8 were also helping on the ice by scouting the new route from the opposite direction. We had to probe extensively, which slowed our pace considerably, since the new route put us between two very large crevasses. Our rope team, probing our way slowly and safely through the maze of crevasses. Photo: Amy Towell. A view from the top of Mount Moore looking down on C8 and the route through the bergschrunds and crevasses. Photo: Amy Towell. After an hour of nerve racking zigzagging and navigating over crevasses, we made it to the safety of our new abode on the slopes of Mount Moore. My feet were happy to arrive and be able to rest for a few days, and the group, as a whole, were excited to eat nothing but waffles for the duration of our stay; Camp 8 has the only waffle maker of the entire icefield! Our mission: eat more waffles than the previous group, which ate 14 in total. Blisters galore. I have been anti-croc for many years, but caved on this expedition. They are actually great for letting blisters air out. Photo: Amy Towell. Our first order of business upon arriving: make some waffles. We were told that food supplies were low, so we had brought oil, pancake mix, peanut butter, jelly, brownie mix, freshies (broccoli, cauliflower, apples, pears, cheese, hummus and carrots), and probably some other stuff. Needless to say, our packs were heavy! Our first batch was reminiscent of grilled cheese with fresh sliced tomatoes. They were delicious. All the fresh food was a nice change of pace from the canned goods that we typically eat at main camps. A photographic summary of life at Camp 8: radio, coffee, power stances and waffles atop the roof. From left to right: Danielle Beaty, Bryn Huxley-Reicher, and Avery Stewart. Photo: Amy Towell. Unfortunately, the weather was quite cold and misty that first night, so we slept inside. On the plus side, we slept great knowing that we were not going to get the standard 0730 wake up call for 0800 breakfast; we were on our own schedule. Our first radio check of the day was at 0845, so we got an extra hour of sleep! I had big plans to nap a lot while at Camp 8, but that did not happen. After our morning waffles (pumpkin, chocolate chip with pears), Dani and Avery climbed Mount Moore while Bryn and I got busy cleaning up camp. There was a large pile of old insulation that had been subjected to the weather for who knows how long. With my handy surgical gloves, I carefully laid out all of the insulation so it could dry and later be disposed of. After the morning chores, Bryn and I got busy washing ALL of our laundry. Hauling our dirty clothes up to Camp 8 also added a considerable amount of weight to our packs, but it was worth it. The author amidst the drying insulation and deteriorated burlap. Photo: Amy Towell. Lunch consisted of broccoli, cheese and cornmeal waffles topped with even more sautéed broccoli. They were fantastic! Just look at that melted, oozing cheese (see picture below). After lunch, I monitored the radio and let my feet rest, while Dani, Bryn and Avery scouted the route we had set the day before. Some of the crevasse crossings had opened up even more, so the route was adjusted slightly and flags were placed for easy navigation. While the gang was out, I received a radio call from Camp 18 informing us that the “fancy dinner” was moved to that night and that we would miss it. We were all pretty bummed since we would have originally made it back in time for the festivities: dressing up, dancing and hamburgers! Our first dinner: cheesy, broccoli waffles. Photo: Amy Towell. We decided to have our own fancy dinner and celebrated by making our best waffles yet. We sautéed broccoli and cauliflower and then mixed that into the batter with cheese. To top the waffles, we made BBQ chicken and two over easy eggs. We had precariously brought two eggs with us with intentions of using them to make brownies. We hadn’t had a fried egg for nearly two months, so they were reallocated for dinner, which really fancied things up. Bryn decided to go all out and made some baked beans and pineapple to top his waffle, too. I literally spilled the beans all over the floor in this process. Cleaning them up actually gave the floor a nice “waxy” shine. We ate our waffles on the roof and completed our nightly radio check-in before hiking up Mt. Moore for the sunset. We felt fortunate to see the sunset because Camp 18 was stuck in the clouds, yet we were above them. We had tried to make brownie waffles for the sunset jaunt, but they didn’t really turn out too well. We spent awhile sitting atop Mt. Moore, taking in the scenery. It is arguably one of the best views from the icefield. With the clear skies, we could see our entire summer traverse, which was super cool and really put perspective on how far we skied this summer. We could see Split Thumb, the peak near Camp 17, where we started. We could see the Taku Towers, near Camp 10. We could see Camp 18 and also the valley where Atlin Lake is situated, where our journey would come to an end in a couple short weeks. We could also see Mt. Fairweather, which is quite far away and impressively large, sitting at roughly 15,000 feet. Our fancy dinner: A waffle with sauteed broccoli and cauliflower with melted cheese, BBQ chiken, pineapple and an over easy egg to top it off. Photo: Amy Towell. That night, we slept atop the roof and were pleasantly surprised with a northern lights show. The aurora forecast was only a three of seven, so we did not expect to see any activity. Bryn and I had never seen them before, so we were in awe, to say the least. Avery, who is from Juneau, said that they were hands down the best three-of-seven aurora he had ever seen and probably the best he had ever seen in general. The next morning, we climbed Mt. Moore a couple more times (five in total for the duration of our stay) and got busy tidying up camp for the next crew to arrive later that day. We also made our last batches of waffles. One batter consisted of cold brew coffee (in place of water) with chocolate chips and roasted coconut flakes. It was easily my favorite waffle. The other batter consisted of pumpkin, oats, chocolate chips, apple, pear, cinnamon, and brown sugar. It was also delicious. We had a lot of batter so these were also made for lunch before we departed. In the end, our group ate a total of 34 waffles during our stay! We left Camp 8 a bit later than we had hoped for, but our next mission was in sight: get back to Camp 18 for dinner at 1900. We cruised back in a swift two hours and made it with 15 minutes to spare. Mission success! One method that scientists use to evaluate the health of glaciers is by digging holes into the glacier surface. On the Juneau Icefield Research Program, students and scientists use this method - known as mass balance - to determine the total amount of water in the form of ice and snow that has accumulated at pre-determined points on the Juneau Icefield in the past year. These measures have been collected since 1948, forming the second longest lasting mass balance record in the world. Recently, fifteen students, faculty, and staff embarked on a three day expedition to the Northwest Branch of Taku Glacier to carry on a part of this long-term survey. Part of the mass balance group skiing to their pit located behind Emperor Peak. Photo credit: Julian Cross. 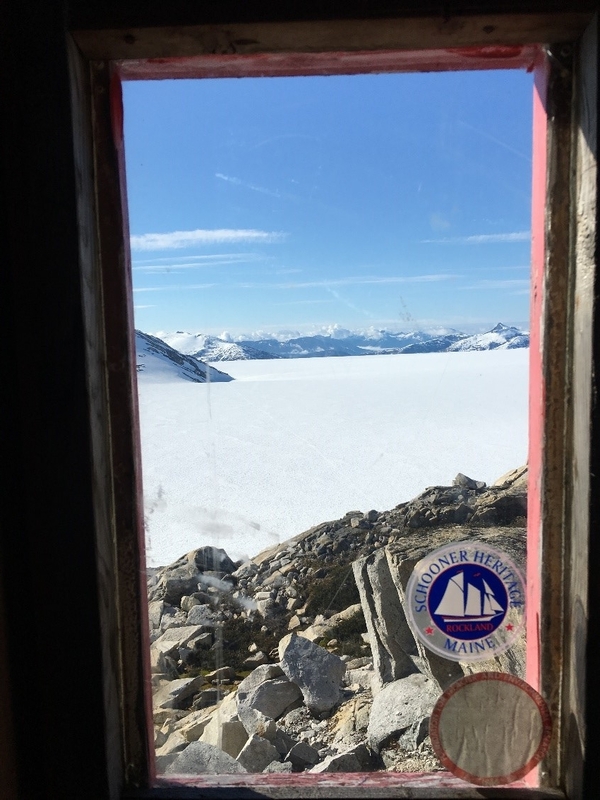 To reach the pits on the NW Branch of Taku Glacier, our group skied approximately thirteen kilometers from Camp 10, and established an overnight basecamp complete with dug-out tent platforms, latrines, sheltered gear trenches, and a cook tent. The second day of the expedition consisted of digging the mass balance pits higher up the NW Branch of Taku Glacier, too far afield to access in a day trip from any permanent JIRP camp. On the third and final day of the expedition we awoke to sunny skies, packed up our camp, and enjoyed the beautiful weather for our ski back to Camp 10. To conduct the mass balance research, on each day of the expedition the fifteen participants would split into three groups, and head from basecamp to different locations to dig their mass balance pits. To document the health of the glacier, the students and scientists dug tirelessly down to the previous summer’s surface, sometimes having to dig over four meters into the glacier! By reaching the previous summer’s surface, the students could sample the snow that fell in the past year, weigh it, and from those data calculate the total mass of ice and snow that was added to that part of Taku Glacier by snowfall. With this information, total mass of snow and ice added in the winter can be compared with the mass of ice lost to summer melt. This comparison can be thought of as ‘balancing the glaciers checkbook,’ and can be used to evaluate the glacier’s health. Basecamp for the NW Branch trip, consisting of four sleeping tents, and gear, cook, and dining tents. Photo credit: Julian Cross. The Ecology research group woke early on a windy and overcast morning to begin our 13-mile trip to Avalanche Canyon. Avalanche Canyon begins at the terminus of Echo Glacier, is the home of abandoned JIRP Camp 21, and was our intended study site for the next three days. Our trail party left Camp 10 in high spirits and with much excitement. Avalanche Canyon, known for its beauty and lush vegetation, had not been visited by JIRP in many years; much of the terrain and conditions of our destination were unknown. The maps available in Camp 10 are several years old. Given the likelihood that the terminus of Echo Glacier had receded a great deal since the maps were made, we knew very little about what the area would look like when we arrived – How far would the glacier have receded? Would we have to cross blue ice? Would we be able to reach our destination at all? We were unsure of the hazards that lay before us, so we took the necessary precautions: we brought our glacier safety gear and our crampons and, as we approached the terminus of Echo Glacier, roped up into teams and probed for crevasses as we traveled. To our great pleasure the route we chose was safe. Under the guidance of our supportive and knowledgeable staff Evan and Annika, we arrived at Avalanche Canyon with ease. Staffer Annika Ord pointing out a snow swamp during the trip to Avalanche Canyon. Photo credit: Susannah Cooley. The trail party was all in good spirits as we came around the final ridge of the trip and the amazing view of Avalanche Canyon came into sight. We made camp on a rocky outcrop next to the margin of the Echo Glacier ablation zone. Our camp overlooked several icefalls, the terminus of the Gilkey Glacier, a wonderfully vegetated refugio called Paradise Valley and Avalanche Canyon itself. The dynamism, the movement and flow of the dramatic landscape was overwhelmingly beautiful. The power of the ice and rocks were humbling; it is an area devoid of apparent human influence, in which geologic forces served as a reminder of the comparable weakness of the human form. As we sat in awe eating our lunch and looking out over this view, I pondered how amazing it is that we, through our actions, are in the process of destroying a landscape that seems so far above the elements of daily human life. Looking out at the view on the first day. Avalanche Canyon, in the middle ground, is vegetated. In the background the Bucher and Gilkey glaciers flow through the Gilkey Trench and out the left side of the frame. Photo credit: Kara Vogler. The Ecology group spent a wonderful three days exploring Avalanche Canyon. We studied the diversity and abundance of plants and lichens, and compared them to the level of development of the soils in each survey plot. We found a strong gradient in vegetation from the highest elevation near our campsite, which was predominantly rocky with few plants, down through the canyon to about 400 ft. below. Here we found a greater diversity and abundance of vegetation including some much larger species such as mountain hemlock and alder trees. Collecting data at the study site at highest elevation with very little vegetation. Photo credit: Catharine White. High diversity of plants found at mid-elevation in a transition zone between the rocky top and highly vegetated valley. Some species in this photo include: Rose Root, White Mountain Heather, Yellow Mountain Heather, Mosses, Grasses, and Fireweed. Photo credit: Susannah Cooley. Alder Tree – found at lower elevation in a highly vegetated zone. Photo credit: Susannah Cooley. 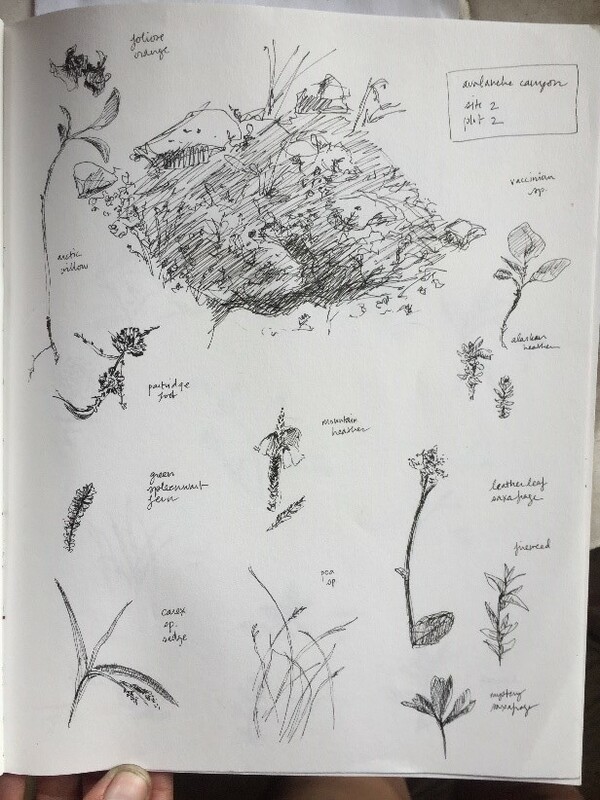 The ecology group was also lucky to have JIRP’s artist in residence, Hannah Perrine Mode, along with us. 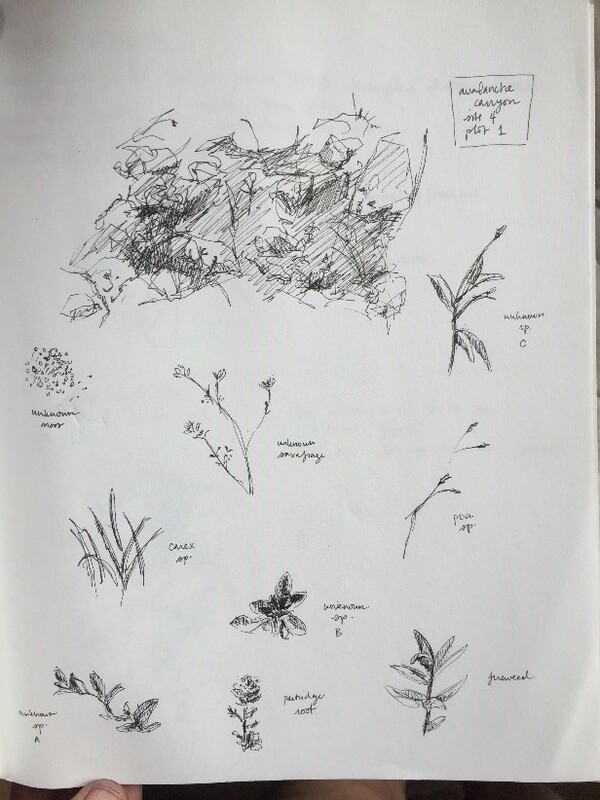 While surveying the area Hannah contributed drawings of some of the survey plots, a beautiful way to represent the diversity of the area and the unique plants we were able to see. Overall, the trip to Avalanche Canyon was a huge success. We were able to survey plants and soils, see a wonderful view, and return to Camp 10 safely. The opportunity to see such a unique area, full of vegetation in an area otherwise dominated by rock and ice, to study plants and soil profiles that I had never seen before, and to return to Camp 10 with information on the current conditions of the terrain surrounding the terminus of the Echo Glacier was a truly unique experience. I’m sure I can speak for all the other students, staff, and faculty who were lucky enough to make the trip over to Avalanche Canyon, that we would definitely return to that beautiful spot if ever given the opportunity. “Good morning, beautiful nerds.” Allen’s voice rings clear, and full of excitement. The clatter of eating utensils, the hum of sleepy conversation, and the overall organized chaos that is each morning on the Icefield quickly fades and is replaced with an attentive silence. We sluggishly turn in our seats towards the back wall. A room of mildly caffeinated eyes focus on Allen, the academic lead, and the “Plan of the Day” white board that (tentatively) organizes each day. I’ve come to learn that life on the Icefield is highly dependent upon factors that we can’t always foresee — weather, snowmobile functionality, a Pilot Bread famine, etc. — and thus our “plans” are always subject to change. “07:30 wake up — check,” Allen begins, ticking off the tasks we have already completed. “08:00 breakfast — check.” He continues down the list, asking for daily chore volunteers, summarizing the day’s fieldwork outings, and concluding with the routine, “20:15 lecture” and “23:00 lights out.” At this point, the morning lull diminishes — fast replaced by the characteristic buzz of curious students energized by the day’s possible adventures. Will we test the skills we learned during safety training and practice crevasse rescue? Will we snowmobile across the Taku marking a new GPS profile? Or will we strap a shovel to our pack and dig a mass balance snow pit? Our minds race as we eagerly consider our options. We all ultimately know that we can’t really go wrong, no matter our final decision. Each option guarantees unparalleled scenery, good company, and new accomplishments, calamities, and understandings that will soon be relayed when we reconvene for dinner. On this day, I decide to tag along with mass balance, and quickly finish my breakfast as others continue to brainstorm. Cooks prepare for the morning breakfast rush. Four-person student cook crews are in the kitchen by 6:00 am to serve hot breakfast at 8:00 am for upwards of 60 people. Here, Camp Manager Annika Ord (left) and Artist in Residence Hannah Mode (at the stove) assist students Susannah Cooley and Benjy Getraer. Photo credit: Jay Ach. “Hey, hey.” Mike, our camp manager’s voice cuts through the building volume. We pause our planning efforts to refocus our attention. “You ready?” he asks us. We grin, and nod our heads — we all know what’s coming. This moment is perhaps the last truly predictable part of each day. For although each morning begins with the same routine, each day holds something different. “Okay,” Mike says, bringing his hands in front of him and hovering his palms a few inches apart. We mimic his motions and anticipate the countdown. “3, 2, 1” he starts. And on “break,” 54 pairs of hands clap in unison, queuing both the mad rush of hungry JIRPers hoping for a second helping of oatmeal and SPAM, and the start of another day at Camp 10. Hungry JIRPers waiting in line for food. With a full camp it takes about 30 minutes for everyone to wind through the breakfast line. The mark of a truly great cook crew is keeping the coffee flowing for the whole process. Photo credit: Jay Ach. Camp 17 is infamous for its cold, wet, rainy weather. After the treacherous traverse there from Juneau, we got one rest day before jumping right into safety training, slogging it out in the rain for five days in a row to become proficient in the skills required to cross the glaciers. I was beginning to feel a little down because of the non-stop routine and horrible weather, so when I was assigned cook duty on the sixth day, I was overjoyed at the thought of being able to stay indoors all day. It was just my luck that this happened to be the first day the rain stopped and the sun came out. It didn’t make me feel any better to see everyone wash their hair and do their laundry under the sunny weather, while I had to cook, wash dishes and crush cans in the cook shack. 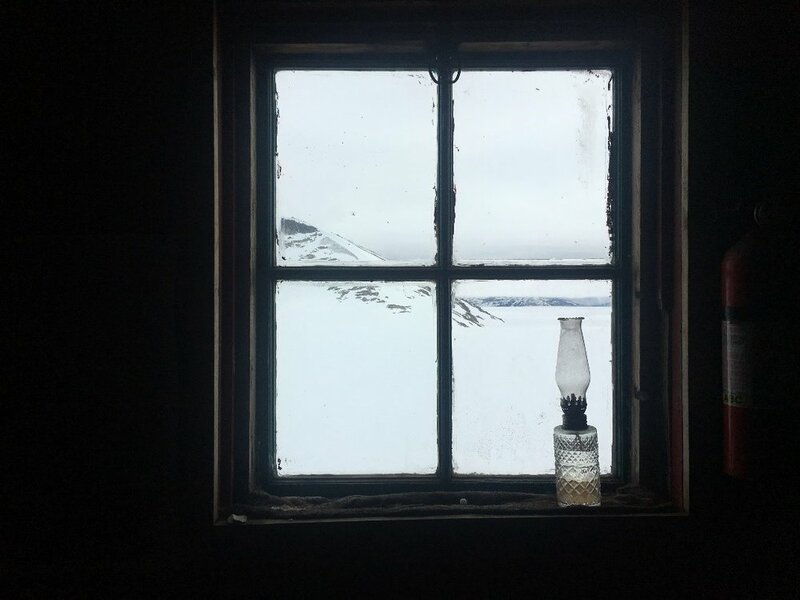 Yearning for a glimpse of the outside, I found a window above the stove and was immediately captivated by the view. It wasn’t solely the scenery that intrigued me, but the combination of the odd-shaped opening, the way the frame caught the sunlight, and the mix of items carelessly placed on the sill. This combination of objects captured the glow and warmth of the outside even better than the scenery itself. It felt like JIRP’s presence on the Juneau Icefield was reflected here, where people lived side-by-side with big nature, coexisting at a comfortable distance for both the people and the wilderness. 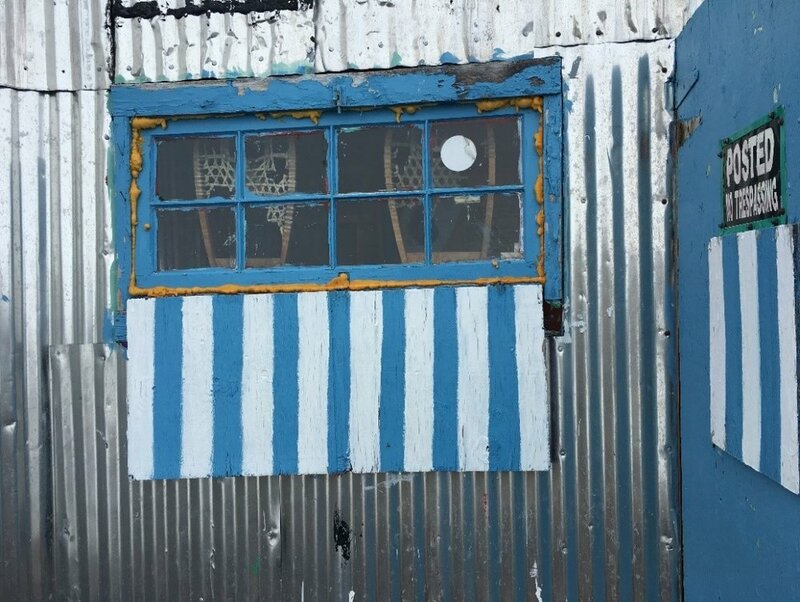 This was when I began to develop a fondness for the windows around JIRP’s camps. The fact that there are so many windows makes it impossible to escape being with the outdoors, even if you’re in. 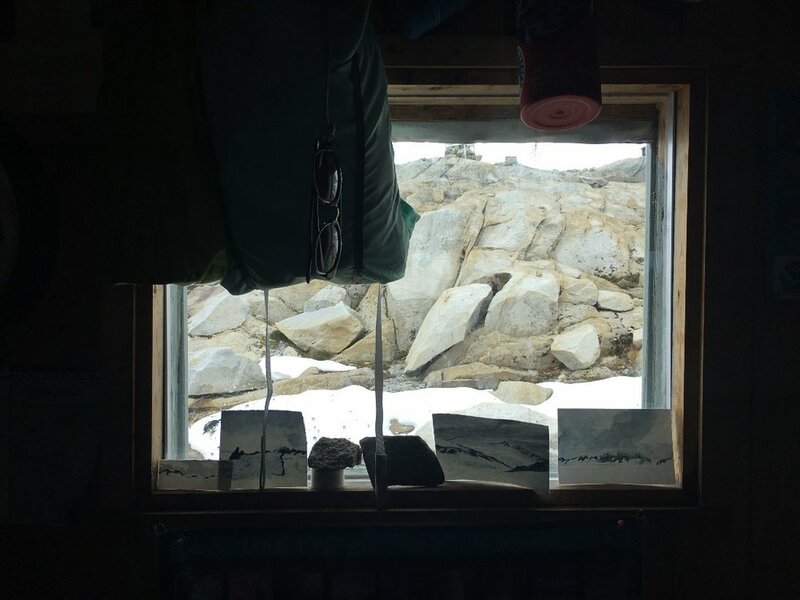 At Camp 10, where there are many more sunny days, the light flooding through the many windows around camp reminds me of Dr. Maynard Miller’s famous words, “Nature is screaming at you”. While every angle of the Icefield is beautiful, I somehow got the sense that each window was intentionally built to frame a certain scenic view. This intentionality really gives the sense that these JIRP camps are lived spaces. They aren’t just shacks for people to take a pit stop, or caches to store gear. They are places for explorers to live and be with nature. Photographing these windows, I found that every one has its own unique character, with its special mix of objects placed around it. Just like the individuals in camp, they each have their own history and personality, and all carry beauty within them. Quietly, these windows invite you to look up and out. And I think this sense of intrigue captures the spirit of many of the JIRPers I’ve met – they are all constantly looking, seeking for different ways to view the world, with eyes filled with fascination and hearts filled with both admiration and curiosity for the beauty around them. I have yet to see camps 18 and 26, but I’m excited to see what windows I’ll find there - I’m sure they won’t disappoint. This year, my research group is planning to take snow samples from the same snowpit multiple times. We want to study how the snow changes over time as we experience different weather patterns such as rain and sunshine. We are hoping that this will help us answer our big picture question for the summer: what affects the ratios of water isotopes on the Juneau Icefield. Now to explain a bit about isotopes and how we can use them in our project this summer! Not all water molecules are the same. Most are the same weight, but there are some that can be heavier. By comparing the ratio of heavier to lighter water molecules in the snow, we can learn about the snow and the conditions in which it formed and fell. We will give a more thorough explanation of isotopes in a later blog post. We were excited to start this project and kick off our summer research. We planned the pit location to be adjacent to our ski hill for easy access, as we would be coming back multiple times to hopefully get new samples. The process of probing and digging went well; we had an idea that the pit would end up being about 160 cm deep. After some digging and snacking we were more than halfway through our pit, at about 100 cm when the snow started getting slushy. Confused, we dug a bit deeper and wider to see if the slush layer continued throughout the snowpit. Not only was the slush layer continuous, but it was 60 cm deep in some places, continuing all the way to the bottom of the pit. After shoveling out some of the slush, we saw that digging further would not be possible; the slush turned to water after a few centimeters, and even if we could somehow remove all of the water, it would just fill in again. We were all surprised to find out that glaciers can have water layers in them, and we definitely could not have predicted it or known that our location had this. Alex Ihle floats on his therm-a-rest in the pool while recording data in the group field notebook. JJ Graham takes a snow sample form the pit while Jane Hamel labels sample bottles and Chelly Johnson organizes the samples. Photo credit: Jay Ach. We decided to have some fun with our discovery, converting half of the pit into a pool by clearing out the rest of the snow and slush layer. Some brave JIRPers went in for the inaugural dip, hot after shoveling in the sun. On the other side of the pit we prepared the wall for sampling by making it smooth all the way down. After collecting snow samples from the wall, we decided to also take one from the water in the bottom of the pit to add to our data of the pit. Even though the pit didn’t turn out how we had expected, it was still a really interesting discovery that we could learn from and use in our project. We were still able to collect data for our project, just with a bit of tweaking. Since the construction of the pit, we’ve had two rain storms and after each one we’ve been able to go back and take new samples. We don’t know yet how the water layer is affecting the pit and our data, but we’re excited to get our results at the end of the summer. This project taught us that field work often doesn’t go as planned, but that you can make do with what you have and still get good data. Ever since high school, I have been very conscious of how water resources vary throughout the world. Of all the water on Earth, three percent is fresh, but two percent is trapped in glaciers, unavailable for human use. The remaining one percent sustains all of humanity, and making sure everyone has access to this resource is a huge global challenge. Growing up, I never struggled to access freshwater, but on the Juneau Icefield, acquiring freshwater requires more strategic planning. The amount of effort we invest in collecting water is ironic, since we are surrounded by huge stores of it. Everyday we ski over, conduct research on, and live next to the Juneau Icefield, comprised of many interconnected glaciers. Southeast Alaska experiences a high amount of precipitation annually, and yet its frozen form makes it difficult to access. Consequently, each day we spend hours of human labor managing our water supply. All of our water is sourced from melting snow. At Camp 17, we shoveled water onto blue plastic tarps, which slowly melted into large trash barrels. At Camp 10 the snow melt drains into a tarp-lined pond. However, currently the clean snow supply is dwindling, requiring the additional use of tarps and trash barrels. Once it’s melted, we use buckets to haul large quantities of water into the kitchen where more large trash barrels sit for use while cooking meals. We heat a small amount for warm hand washing water. The water supply at Camp 17 is shown above, displaying the tarps onto which we shovel snow from the patch just off the bottom of the photo. A piece of white gutter connects the tarp to the trash barrel, into which the melted water drains. A sauce pan can be seen on the side of the barrel on the right, used to scoop water into buckets for transport. Photo credit: Ann Hill. The water is never filtered or sterilized before consumption, making it imperative that strict measures are taken to keep our water sources clean. Water bottles and cooking pans must never directly touch the water supply. Instead, we use sauce pans to dip into the barrel, and only the handle may be touched so no hands ever come into contact with the water supply. The pan must only be set in its proper place, never on a counter as it will become contaminated. While initially these rules seemed rather overbearing, they are essential in limiting the spread of germs through camp. Each day a student is assigned the job of Camp Assistant. Their job largely consists of shoveling snow from the source to the tarps, hauling water to the kitchen, and filling the hand washing station. This takes a lot of time, and proves physically demanding. For personal tasks, such as doing laundry or taking a shower, snow must be melted in large metal buckets instead of on a stove because the phase change from solid to liquid requires a lot of energy, and it is expensive to bring fuel to the Icefield. At home, we also rely on a complex set of processes to obtain this valuable resource, but they take place mostly behind the scenes. People have jobs that involve pumping water up from the ground, or managing treatment facilities to make water available at the turn of a faucet. Today’s infrastructure places distance between us and the technology behind our tap water, but here on the Icefield that distance disappears. 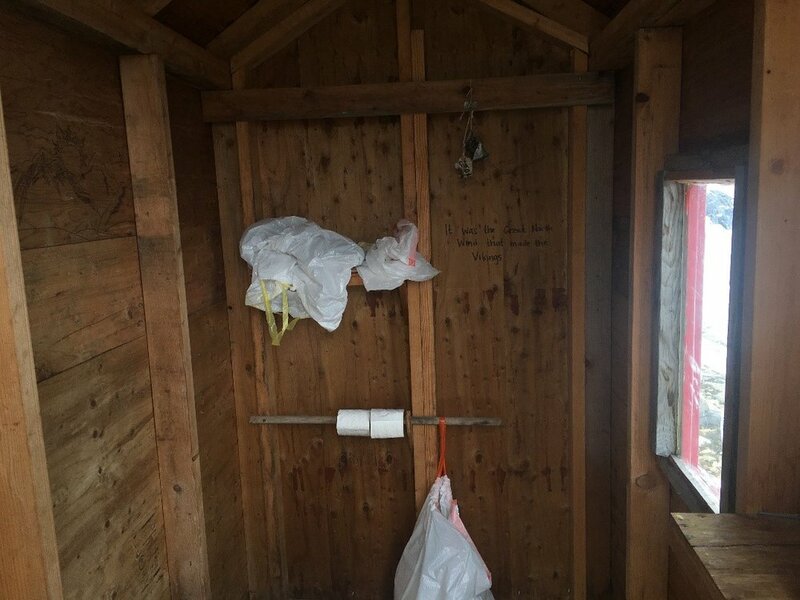 The above photo shows the water supply system set up at Camp 10. The pond acts as the main water source, and additional tarps have been set up to drain water into the pond, as the snow directly surrounding the pond has melted. Photo credit: Ann Hill. For the first week at Camp 17, we experienced nothing but bone-chilling wind and rain. All our gear was soaked through, we were constantly wet and cold, and the weather was starting to take a toll on the group’s morale. Poems, songs, and jokes about the weather kept us sane. For example, Christoph gave an optimistic speech about how the rain “made us closer,” and Jane re-wrote the Pledge of Allegiance on July 4th to include bits about the poor conditions. For me, there was one thing I knew would cheer me up, and that was skiing. I’ve always loved making turns, and despite the weather, I knew the glacier was calling my name. I was tired of the weather deciding our actions for us. If I didn’t ski soon, I was going to lose my mind. One night after lecture, I decided the time was now. Outside it was cold and misting; poor visibility made the Ptarmigan Glacier (“The Gnarmigan”) look like the inside of a ping-pong ball. Everybody was huddled around the dinner tables of the warm Cookshack enjoying coffee and hot chocolate, which didn’t make skiing seem very attractive. I knew it was going to be difficult to convince somebody, but I needed a release from the weather. I was more excited than ever! I ran to grab my ski boots (neglecting Annie’s rule of “no running” around camp) and rushed to strap them on. Peer pressure must have convinced everyone else, because I ran back to find Matt, Frank, Chris, Evan, Mike, and others also strapping on their boots, getting ready to shred! There was even a single sliver of blue sky (retrospectively, it was probably more of a lesser-gray patch) above us. Other students grouped outside around Avery, who was jamming on his ukulele and singing songs about the weather. Everybody made a tunnel with their ski poles, and one by one, we all dropped in to the foggy ping-pong ball. I’m not a good skier, so while I was busy holding my skis in a “pizza” all the way down the hill, everyone passed by and eventually I was all alone inside the mist. Despite my lack of skill, I was having a blast. When I finally got to the bottom, everybody was cheerful, dancing, laughing, and having a great time, which made me even more stoked. Despite the weather, we were all outside enjoying ourselves and having fun. All it took was a positive attitude and some good skiing. We climbed back up, made another tunnel, and dropped back in for another awesome, misty run. Adjusting to life on the ice comes with learning a unique set of skills and routines. Some of the daily chores are variations of familiar things (like using water and sweeping), and other skills are things I think many of us thought we would only see in the movies if it weren’t for JIRP. The following pictures capture highlights of our time at Camp 17. One of the first things we did upon arrival to camp was set up water collections. We did this by framing tarps with 2x4s to funnel into a gutter and then into a bin after shoveling surrounding snow onto the tarp. It’s good to scrape off the top layer before shoveling, but no filtering or purifying needed! Photo credit: Kelcy Huston. Our first week had a heavy focus on ski training and safe glacier travel practices, which requires learning to “rope up” in case someone in a trail party falls into a crevasse. This way, if someone were to fall in, everyone else on the rope team drops to the ground to prevent a long fall and prepare the next stages of rescue. Photo credit: Kelcy Huston. Building on roping up, we’ve also been practicing building anchor and pulley systems to actually be able to pull people out of a crevasse. Snow anchors allow us to take the weight of the fallen person off of ourselves and the pulley systems give us mechanical advantage to pull them up more easily (it was an added training bonus that it stopped raining and the sun shined for the first time in 6 days!). Photo credit: Kelcy Huston. When not out in the field we’ve been having evening lectures from guest faculty, starting to think about our own upcoming research, and taking in the views. Photo credit: Kelcy Huston. ****Special happy belated birthday to my Dad – hope it was a great one, I love you!